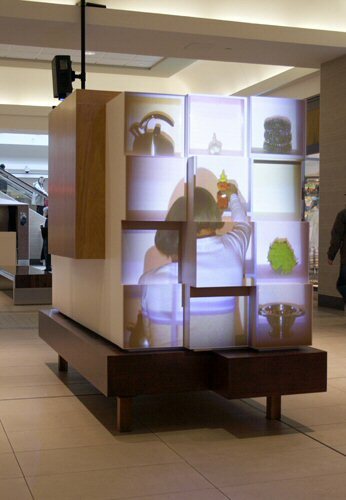 TORONTO, ONTARIO--(Marketwire - May 27, 2009) - Fairview Mall, Toronto has acquired video sculpture titled, Kiosk, by Toronto artist Lyla Rye. Kiosk is a site-specific contemporary art sculpture originally commissioned as a temporary installation at Fairview Mall for the Encounters with Art™ Series. Kiosk is installed on the lower level near the H&M corridor of Fairview Mall. "We are delighted to present and acquire exceptional artworks by contemporary Canadian artists like Lyla Rye in the unique and accessible setting of Fairview Mall," says Kevin Gray, General Manager, Fairview Mall. Kiosk is a video sculpture designed to resemble an empty mall kiosk. Although empty of objects for sale, it is filled with desire in the form of two projected videos. In these videos, a woman arranges objects for display in increasingly unusual ways provoking questions about why we choose to display only certain objects. The manner of filming causes her to merge with the kiosk. The Encounters with Art™ Series is a dynamic cultural initiative of Cadillac Fairview, that incorporates contemporary art and education at Fairview Mall. The series recognizes how contemporary art enriches people's lives by engaging their senses, igniting their imaginations, and creating stimulating environments that they enjoy visiting. "By bringing contemporary art to where people interact in their daily lives, we hope to connect with as wide as an audience as possible and stay vibrant and relevant to the community," says Melody Fallis, Senior Marketing Director, Fairview Mall. Commissioned as the inaugural installment of the Encounters with Art™ Series, Rye's Kiosk was selected amongst a short list of artists by a panel including curatorial advisor, Gordon Hatt. Through collaborative efforts, the Encounters with Art™ Series can assist artists and art practitioners in the creation and adaption of new work in the public realm of the shopping centre. "I was intrigued by the challenges of this site and impressed with Cadillac Fairview's inclusion of art into the vision of the new Fairview Mall. ", says Lyla Rye. Fairview Mall completed a $90 million in 2008 that added exciting new retailers to the centre and enhanced shoppers' experience with rejuvenated common areas. In recognition of their quality leading-edge architectural redesign, Fairview received from BOMA, the 2009 Beautiful Building of the Year Award. For more than three decades, Fairview Mall has enjoyed close ties to its North York community and supports many worthy causes, including SPIRE Scholarship for graduating high school students in the GTA and the Canadian Centre for Abuse Awareness's Women Mentoring Women Program. Fairview Mall is managed by Cadillac Fairview Corporation Limited and is a 50/50 joint venture with Ivanhoe Cambridge Inc. Fairview Mall is directly accessible by the Yonge-Sheppard subway and attracts 15 million visitors annually.